Tourism Geography shares a Facebook and Twitter account with the Tourism Geographies journal. 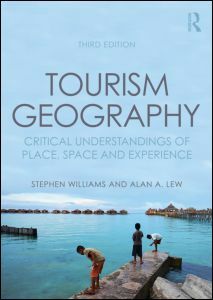 This third edition has been revised by Dr Alan A. Lew, who becomes the new co-author of Tourism Geography. Some of the major revisions that I have incorporated include moving most of the case study boxes to this website <tourismgeography.com>, which will provide a growing wealth of new case studies, over time. I have also incorporated new material, reorganised some of the content to balance the topics covered, created a new concluding chapter that explores some recently emerging perspectives in critical tourism geography, and re-written the text to make it more accessible to a global English speaking world. That said, the book is still very much the work of Dr Stephen Williams. As such, it maintains its original concise yet comprehensive review of contemporary tourism geography and the ways in which geographers critically interpret this important global phenomenon. It is written as an introductory text for students, and includes guidance for further study in each chapter that can form the basis for independent work. Instructors using this textbook are welcome to contribute to the book’s content development through this website by contacting me at any time. - Alan <alan.lew@nau.edu>. To review copy of the book for potential adoption for a class, please click here. Stephen Williams is Emeritus Professor of Human Geography at Staffordshire University, UK. His extensive interests in recreation and tourism are reﬂected in his publications, which include Outdoor Recreation and the Urban Environment (Routledge); Tourism and Recreation (Prentice Hall), and a four-volume edited work Tourism: Critical Concepts in the Social Sciences (Routledge). Alan A. Lew is Professor of Geography, Planning and Recreation at Northern Arizona University. He is the founding editor-in-chief of the Journal Tourism Geographies and his publications include World Regional Geography: Tourism Destinations, Human Mobilities, Sustainable Environments (Kendall-Hunt) and Understanding and Managing Tourism Impacts: An Integrated Approach (Routledge). Links to these and additional information can be found at <alanlew.com>.